We were going to hunt Grendel. The reports said that since the late ’60s witnesses have been calling it the Big Muddy Monster around here, but we had it otherwise on good authority. Joyce Carol Oates had told Pinckney that John Gardner had told her that he had seen it. First he had heard it howl deep in the woods somewhere one night, and then, one afternoon as he roamed the backroads, he had been forced to rip his wheels to a stop, his bike nearly kicking out from under him. It had crossed the gravel right before his eyes. And it had passed into the shade through some honeysuckle brush, slouching, and the birds hadn’t even scattered as it went, but it had been angry regardless—Gardner had just known it. And it stunk. This was while he was teaching down here at Southern Illinois University at Carbondale, and he had told her that seeing it had inspired him to write Grendel, and that some time during the writing of it he had begun to believe that it had been the real Grendel, somehow, a calling, a message from the sons of Cain. Never mind that Joyce Carol Oates had said that John Gardner was drunk while he had told her this, and drunk when he had seen it. No such details would interfere with our hunt. I was packing my late father’s Western-style lever-action—a .308 Savage—in his honor. He had gone monster hunting himself back in Kentucky before I was born, but had found that the lunatic baying the farmers complained of were only highway guardrails popping and echoing as they cooled from the sun in the evening (though the chickens that had been found folded inside-out were never explained or accounted for). Kermit was a deputy in Roanoke, Virginia, and had driven up, just for this hunt, in a tiny little bright-orange fuel-saving two-door, but he was about as big as the car. He also taught self-defense for charity—two canned goods per lesson—but I figured the best lesson was simply to be his size. In the hatchback he had a duffle bag full of Glocks (I never found out how many) and a 12-gauge drum-fed Streetsweeper that he had confiscated and would use as a demonstration piece when he taught classes to other law enforcement folk—just to show them what the bad guys might be hiding in their coolers when you think they’re going for a beer. One time he got pulled over with it just sitting there in the back seat. He showed it off to the state trooper, and they got to talking, and they spent the rest of the day just a few miles up at the trooper’s uncle’s farm blasting surplus garden veggies and talking about the filming difficulties of Creature from the Black Lagoon. But for our hunt, he was packing nothing more than a BFR .50 Caliber Beowulf, for poetic reasons. Right before dusk we parked out of the way at the mouth of an old logging road, and we spent a few minutes cutting thick-leaved branches and covering the car with the foliage to hide it from sight. It did not matter whose sight we were hiding it from. In such endeavors, to get identified was to fail. We walked through the treeline and kept quiet for a space. The logging road was a long lawn of grass and dandelions, and it took us past a couple of small fields heavy with soy and fenced by trees. The haze of the low light colored the soybean leaves navy, and they steamed. When the woods got thicker beside us, we left off the logging road and hiked in. We wouldn’t need trails. Grendel wouldn’t use trails. The canopy turned night immediately, but we still spooked away plenty of birds and squirrels hard at work, all well awake. The air was fatty with the noise of crickets. We stopped every so often, Kermit and Pinckney scanning the area and listening. I would begin to do the same but would get distracted with trying to identify possible poison ivy. We were all sweating and wiping at mosquitos. “It was never reported to be seen in exactly the same place twice,” Kermit said. It was the first any of us mentioned of the fact that we hunted in an entirely arbitrary location. Any spot was as likely as any other. We all agreed, and we kept moving. Soon we were using flashlights and stopping more frequently at sounds that skipped through the brush. We climbed across a creek and got nice and muddy—something that I noted would legitimize our trek—and were working our way up an ascent when we spooked it. It was Grendel for sure. But Kermit caught them in his light, fleeing in slow leaps, white tails flagging us. So we kept on. And that’s when we found the shack. We swept the perimeter like we had practiced (in person once, a dozen times online, in-game). No one had cared about this shack in years, clearly, but our tactical movement was no less sharp for that fact. Pinckney hacked the kudzu out of the way so we could open the door, and we went inside. Someone had lived there, once. The skeleton of bedsprings sat near a woodburning stove on its side, though we saw no flue. Coffee tins and swollen car manuals lay scattered on a desk and on some chairs taken from a hospital. All of the more recent cans of beer and party cups were empty and on the floor. An old toaster’s guts hung out across some screwdrivers and sockets, and in the corner I pulled back a sheet to uncover a piano. Pinckney and Kermit high-stepped it over the debris to see it with me, and they both said that it was actually a spinet. I said, “Oh, yeah,” as if I just remembered that. I tried a couple of keys. They were dead. Then Pinckney found a key that worked. The twang it made was lonesome, quite unlike what it was surely meant to be. “Listen to that,” he said. He kept hitting it. He was hearing some beautiful quality in its sound, in the way it echoed against the corrugated roof, something I wasn’t getting. He produced his cell phone—though none of us had signals out here—and he began recording while I beat on the key for him. He was going to use it later for some of his foley projects. The string kept humming long after I had let up on the key, but then I realized that some of the sound came from farther off. We followed him in a rush outside, and we moved from concealment to cover with the urgency of a raid. But I couldn’t hear anything now that we were outside again, and Pinckney didn’t seem to either. We just followed Kermit. At the crest of the ascent, we went prone to avoid the risk of skylining ourselves, and Pinckney scoped ahead with the Humanity Department. It was completely night now, even above the canopy, and we had switched off and gone dark, as black as the leaves. The little lights beyond the trees made me certain that something was going on in the pasture down there. I could now hear the distant droll of voices. “What is it?” I said. “I think I see it,” Pinckney said. We walked the pasture, which had none of their cars or vans or busses, only horses and buggies, so I guessed that they had met up over at Bald Knob Cross and had come down here on the trails the hard way, to wheel back time just a little, for their own theatrics. They peeled open the tent flaps and welcomed us into the revival without a word about our guns, though they eyed them. I imagined they thought something at us like, all they that take the sword shall perish with the sword. But then I thought back, he that hath no sword, let him sell his garment and buy one. But then they thought back, I will rid evil beasts out of the land, neither shall the sword go through your land. And I had no comeback for that one. Inside was an oven full of swaying bodies on folding chairs, kerosene lanterns swaying with them from ropes above, everyone rejoicing in their sweat, which they would not wipe as if it were finally a rainstorm promised them. We were packed in, unable not to touch each other. I stood on my toes to lift my head above the stench of hot body odor that stayed on a roiling boil. The closer to the front, the more the charismatics were standing or kneeling, arms moving like snakes, heads lolling. Beside him, two old women in long skirts beat on the bodies and pickguards of their guitars, but they did not strum, and a third one swept at the grass on the ground beneath them with a broom. They danced. An Army officer in uniform—a full-bird colonel—stood at the front too, tapping a tambourine. The people moaned. They laughed, and they moaned. “Yea!” the people said. “Yea!” And some of them spoke with words of bubbles and gargles that I did not understand. The preacher stepped off his trunk, and he motioned others toward it. Two men came to him, knelt by the trunk, and began to unlatch it. A few in the congregation fell to the ground and called out. I already knew what was in the trunk before he reached in. They migrated through this area every year, and it would be easy enough to gather a trunkload of them as they crossed the roads. The preacher reached in, and he lifted forth a rattler by its middle. He spoke the right verses about it, and it whipped around, easily capable of sinking fangs into his arm, but it didn’t. The people moved faster now. They got louder, and they moved faster. The place was a wave pool, too crowded, moving me with them. They babbled. They didn’t sing, but I heard the music. I heard the music with them, finally. I was moving to it with them. Kermit said my name, as if to ask me if I were okay. But I knew there were more rattlers in that trunk. They shook their tails to our music. I could lift one too. “I’m going up there,” I said. “I’m going up there,” I said again. And Pinckney said, “He’s going up there!” as if it never occurred to him to try stopping me. Kermit held my arm, but with all the sweat I slithered right out of his grip. And the preacher waved me forward, and the people waved, and I washed up in the front, at the trunk, and the rattlers smiled up at me. “Just keep running!” Kermit screamed, hauling me over his shoulders, the tent ablaze behind us, pillars of smoke and pillars of fire roaring with pressurized tank explosions and the wails of the charismatics. I cried and screamed in high-pitched delirium. My arm was swollen and already turning black from the crook of my elbow out, almost as if the bite had burned me to a blistering crisp. Pinckney ran ahead with the Humanity Department in one hand—stock in armpit, ready to shoot anything in our path—and in the other hand a thrashing sack that held the rattler that had gotten me. He was screaming. Things had gone wrong back there. One after the other, many things had gone very wrong. We rushed through the lattice of limbs and leaves in the woods, and my arm hurt—like it was being torn off—as I was jostled by Kermit’s carrying me while running, but I was in no condition to do my own running. I was lost to terror and prophecy, crying out that we would never make it through this night, that the world itself would come to an end. The fires behind us caught hold of the treeline. The night sky soaked up its hot bleeding orange. I suppose I was the only one of the three of us watching the scene behind. I saw silhouettes of men and beasts all a-scatter. Large shapes galloped past us faster than we could ever run, but we kept running. Without stopping, Pinckney shot at something close to his feet and kept running and screaming. Kermit didn’t slow either. I felt us rise over a hill and run down another valley, deep and swamplike. And that’s when we stopped. They stopped screaming, so I did too. Only then could I hear the lunatic baying right in front of us. The thing rose from the liquid ground, its long head dripping, its thin arms melting and batting at the air as it screamed high and terrible. We stood in a lagoon, a mire, and it stunk like sewage and swine and death. The thing writhed in the middle of that mess before us, the black goo of its skin gleaming in our lights, the ribs of its barrel body shining like rippled shelves. Kermit and Pinckney said nothing, unsure of what to do for it, but it bucked, and shook its drenched mane, and bit at the mud with the flat of its teeth, and it kept screaming at us. Only I, in delirium, could see the truth of what it was. And in the wild whites of its eyes, and in the blacks of them, it saw me too, and we both knew the sight for what it was. It was the Big Muddy Monster—it was Grendel. It was Humbaba, Minotaur, Behemoth, Fenrir, Cacus of the Eighth Layer, Moloch the Counselor, Nightmare, the Creature of Frankenstein, Id, Gothmog, Yog Sothoth, Anung Un Rama, and, lo, the Black Horse, whose rider held balances in his hand, whose rider was lost from his mount. It sank in the tar, and I with it, the two of us plates on the scales tipping in turns ever lower under the waves of the mire too slow to perceive, and we could no longer see one another, where we lay crushed in unison under the surface of the earth, as if embraced again by an inexplicable mother, where heat and gravity sang to us, where all things become one in the end, where we could no longer see where either of us began, finally knowing what monsters are for. Josh Woods loves monsters, ancient and esoteric lore, comedy, combat, storytelling, hiking, professional wrestling, making stuff, and learning almost anything he can. And he enjoys teaching what he has learned and figured out to others. He has recently released his first novel, The Black Palace, and has published genre and literary short stories in numerous journals, magazines, and collections. 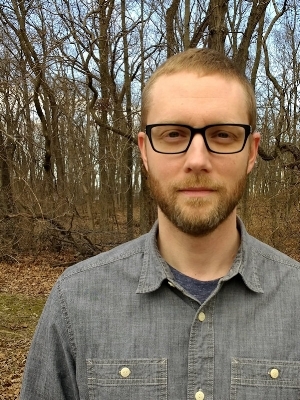 He also edits anthologies, teaches creative writing as an Associate Professor of English in Illinois, and writes about techniques and strategies for the craft of fiction. For more info, visit him at his website. Some parts of this fiction are inspired by facts. Reports of Big Muddy Monster sightings started in that Southern IL area in the late ’70s, when John Gardner was there writing Grendel. Gardner often confided in Joyce Carol Oates, who was, in turn, close to her “best student of all time,” Pinckney Benedict, who now lives in the Big Muddy Monster’s territory. Pinckney, Kermit (a real deputy in Roanoke), and I have spent time down there shooting at things. Our characterizations are pretty loyal to real life. Rattlesnakes do migrate through that area at a certain time of year in frightening numbers. I have gone a-hunting for the Big Muddy Monster, but it was uneventful except for a tree falling on author/NEA recipient Alexander Lumans (to be fair, Lumans kicked it first). The preacher’s glossolalia in the story translates to a phrase from Lovecraft, “In his house at R'lyeh, dead Cthulhu waits dreaming.” And the list of monsters at the end is nearly a survey of the readings I would have in my ideal “Monsters in Literature” course. People assume that I’m far more cultured and political than I am. Maybe it’s the glasses. Definitely the wolf Fenrir: When Ragnarök comes he “will advance with wide open mouth, his upper jaw against the sky, his lower on the earth (he would gape more widely still if there were room) and his eyes and nostrils will blaze with fire” (from The Prose Edda by Snorri Sturluson, trans. by Jean Young). Doesn’t that sound delightful? I’m for gaining proficiency in all three, and being prepared to cheat if necessary.